Most students are taught that the Europeans colonized North America for political and religious freedom, but natural resources were another major reason. Sure they were in search of gold, cod, whales, and even lumber for shipping, but the resource that tempted explorers across the ocean was one the largest rodents in North America, the beaver. Health and Wellness - Fries with That? How well do you eat? How often do you hit the fast food joints? In this unit students will engage in several activities to learn about the importance of nutrition. They will compare meals from two fast food restaurants of their choice, create a menu and design their own restaurant. This lesson combines social studies, language arts, technology and art. It requires students to use the computer and sharpen their ability to access and manipulate artwork, research and text. With the IRTR and Library Media Specialists, students select an explorer from their curriculum, research the essential questions asked, create a bio-cube based on their research then using a draw program, design the first and last name of their explorer. In addition, they will find pictures (maps) of the explorer’s voyage. Primary sources expose students to different points of view on issues from the past and present. Interpretations of the past are constantly discussed and debated. By working with primary sources, students can become informed and join in the debate! This lesson takes students on a virtual field trip through the National Archives. History is full of catch phrases and slogans. For example, do you know who said this and why? Students will have fun creating their own bumper sticker (or horse & Buggy sticker! )based on a historical time period. L.A. - What's Your Story? Is it true that a picture is worth a thousand words? In this project, students will be able to put that theory to the test. They will be creating a photo story of their life using a collection of photos, but there is a caveat, the pictures will not be personal in nature, rather, they will be researching pictures from a given list that represents them in many ways. This activity can be done on a computer or a mobile device. In addition, students will learn how to use the advance Google search for copyright free images. Students will also review the Fair Use Policy for adding music to their presentation. Before the European explorers arrived, American Indians, also known as the First Americans, spread out and settled many areas across different environments in North America. 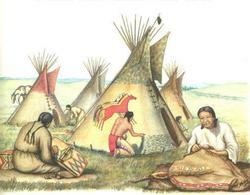 In fact, members of these tribes still live in their homeland and in many other areas of North America today. In this project, students will work together to create a multimedia presentation to share information on a specific North American Indian Tribe.